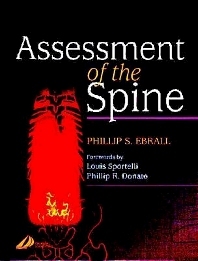 Efficient and integrated, this text provides knowledge about approaching the manual assessment of the spine and its related articulations. This information is presented in a clear and concise way, in order to make it suitable for students, while remaining relevant to current practitioners. The content provides descriptions and discussions of a variety of observational and manual techniques of examination and assessment, as well as guidance on recording and analyzing the findings to arrive at an appropriate working diagnosis. The illustrations, which include line drawings, radiographs, and photographs, contribute to the reader's learning by providing helpful visual aides. The coverage presents a fully comprehensive approach to spinal assessment and the techniques involved. Recognition of other professional groups acknowledges their aspects of techniques, as well as providing the reader with relevant knowledge that is now becoming part of chiropractic practice. Key points and tips, practical learning tasks, and strong visual design help teach various aspects of chiropractic practice. Vivid illustrations, including photographs, radiographs, and line diagrams, aid the reader in learning what is under the skin, so that they know what they can feel, as well as what they can see. The content will provide a sound base for learning about treatment and for putting it into practice. Essential for safe referral, the material encourages organized and coherent history-taking and recording of findings in a way that can easily be referred to by other practitioners.